Thirteen-year-old Natalie Minks loves machines, particularly automata--self-operating mechanical devices, usually powered by clockwork. When Jake Limberleg and his traveling medicine show arrive in her small Missouri town with a mysterious vehicle under a tarp and an uncanny ability to make Natalie's half-built automaton move, she feels in her gut that something about this caravan of healers is a bit off. Her uneasiness leads her to investigate the intricate maze of the medicine show, where she discovers a horrible truth and realizes that only she has the power to set things right. Set in 1914, The Boneshaker is a gripping, richly textured novel about family, community, courage, and looking evil directly in the face in order to conquer it. 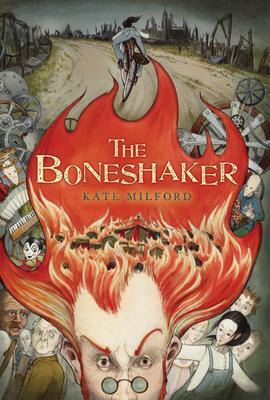 Kate Milford is a published playwright and screenwriter, and author of The Boneshaker and Greenglass House. She lives in Brooklyn, New York. Visit her website at www.clockworkfoundry.com.